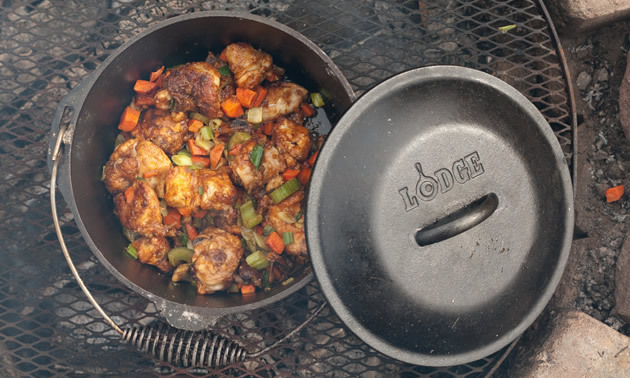 One-pot meals over the fire are simple and delicious anytime, but especially so when camping. Once you have a assembled the ingredients and equipment, start a fire over which you'll cook dinner. 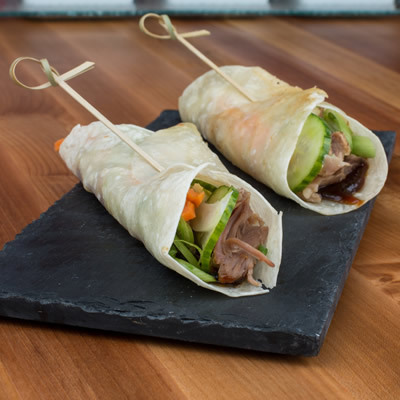 This recipe will serve four modest appetites. If you and your guests are ready to tuck into a big helping of chicken, cook the whole chicken and double the rest of the ingredients. Half frying chicken, backbone removed. With a 10-inch French knife or fine-bladed cleaver cut chicken (bones in) into thumb-sized pieces. 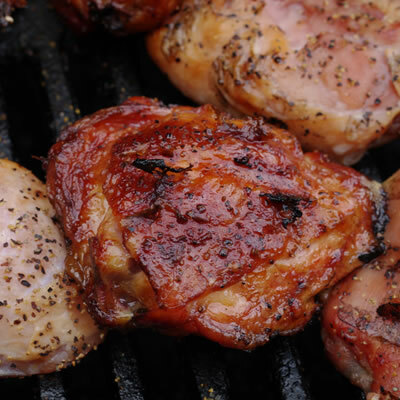 You may substitute a combination of boneless breast and chicken thighs if you wish, but you will give up some flavour and the fun of spitting out bones. 1. Start a cooking fire. 2. Wash, peel and cut vegetables. 3. Remove the backbone from a chicken, separate into front quarter and back quarter, cut each quarter into 6 to 8 pieces. 4. Mix flour and spices, stir well to evenly distribute. 5. Heat the cast-iron Dutch oven over a medium fire to near smoking. 6. Add 2 tablespoons (30 ml) of olive oil. 7. Toss chicken pieces in breading, shake off excess flour mixture and add chicken to the pan in one layer. 8. Brown on one side (about 8 minutes) then the other (about 5 minutes). 9. 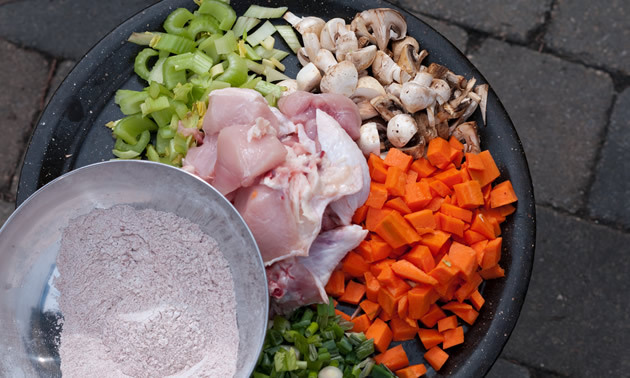 When the chicken is browned on both sides, add the vegetables, stir with a spoon to mix and cover. 10. Remove to a gentle fire and simmer about 20 minutes, stirring every five minutes or so. 11. When the carrots are done, add 1/2 cup (125 ml) whipping cream and 1/2 cup (125 ml) of chicken stock, stir and cover. 12. Simmer 10 minutes more. Serve on egg noodles, fried shredded potatoes or steamed rice. I prefer my starch cooked separately, but you could easily add diced potatoes to this recipe with the other vegetables or rice and the additional liquid required to cook it right in the pot. Note: Add another side of vegetables if you wish—I like wrapped fresh asparagus in foil. (Wash and snap root-ends of asparagus and set on a square of aluminum foil, drizzle with olive oil, dust with vegetable spice mix and Sriracha lime powder. Sprinkle with a bit of asiago or parmesan cheese. Wrap in foil, folding the ends tight to keep the steam in and grill over the hottest part of the fire, about eight minutes, turning once.